When you dine at Jiko, you’ll want to pay attention to the space around you. 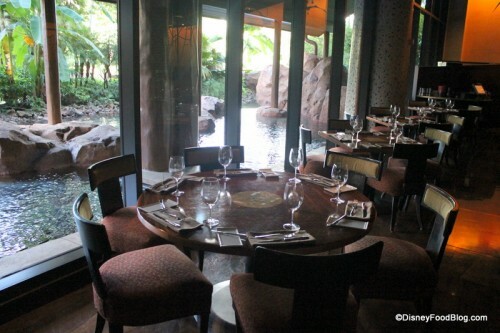 The restaurant is full of details that reflect the cultures and environments of Africa. Lighting on the back wall of the restaurant changes throughout the evening to mimic the many shades of sunset. It lends some lovely ambiance. 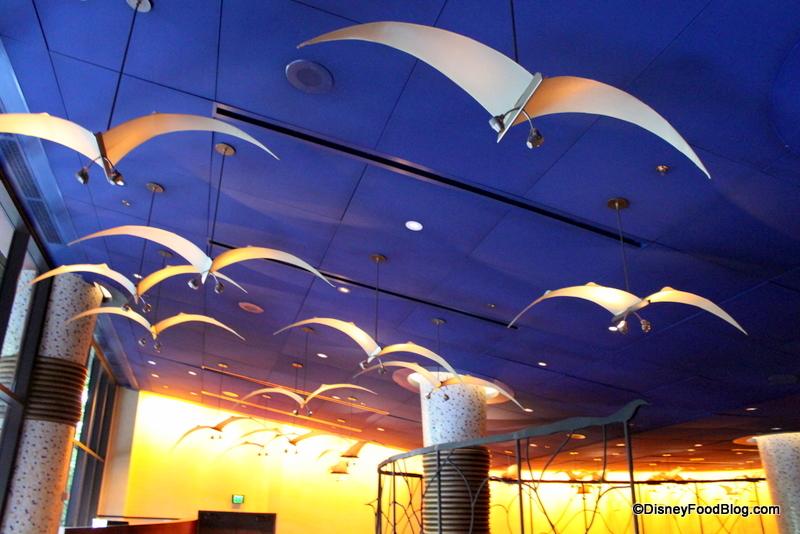 Above, the space is home to stylized birds, which are said to bring good luck. Likewise the floors include stylized images of grain, also to symbolize good luck and good harvest. 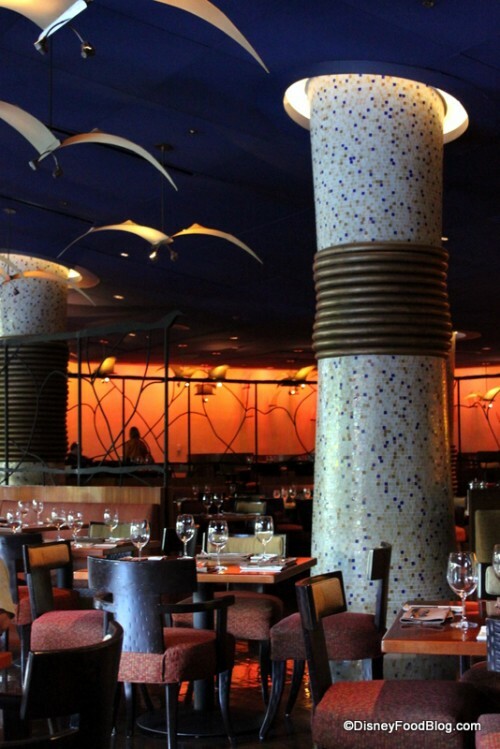 Rings encircling the pillars of the restaurant are designed to mimic the neck rings worn by women in some African tribes. These rings symbolize wealth and beauty. 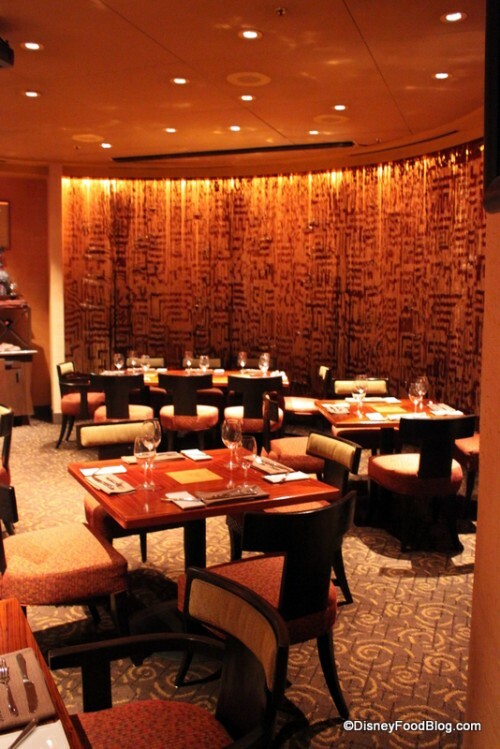 Seating in the restaurant is at tables, booths, and in banquettes. Window tables look out on a gurgling brook and some stonework and greenery. Note that banquette seating means diners may be elbow to elbow with those seated at the next table. If you’re looking for a little more privacy and space, be sure to specify to cast members at check in that you’d prefer non-banquette seating. 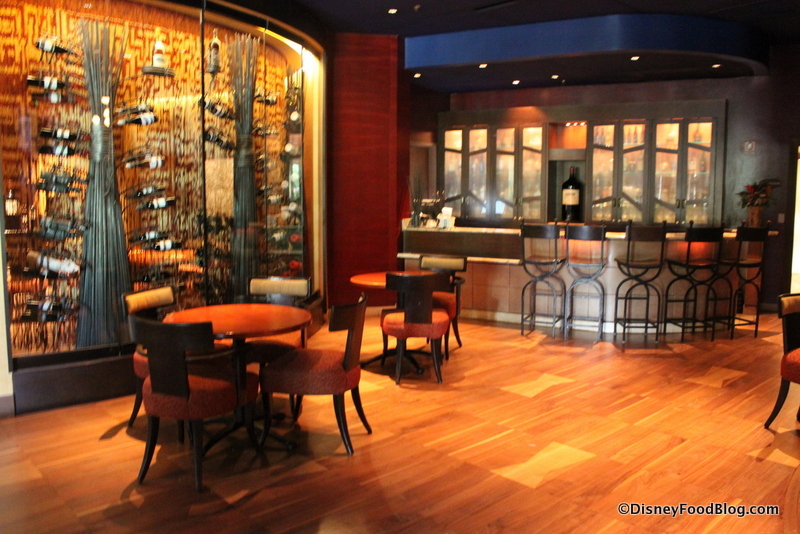 There are times when seating in the wine room is available to diners. This intimate room is a lovely, warm place for a quiet dinner. 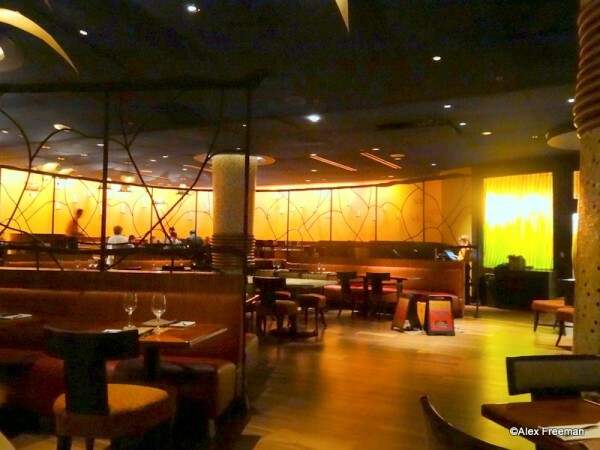 The thoughtfulness of the symbolism in Jiko creates a warm, vibrant atmosphere in which to dine. And maybe all that symbolic good luck will translate into a tasty meal! The menu at Jiko changes regularly, reflecting the seasonality of the ingredients and creativity of the chefs. The drink menu offers cocktails taking their inspiration (at least in name) from Africa and a wine list consisting of wine representing several regions of the African continent. The wine is such a draw here that the restaurant even hosts a wine tasting on select Wednesdays. On my visit I passed on wine but ordered the Kilimanjaro Margarita. 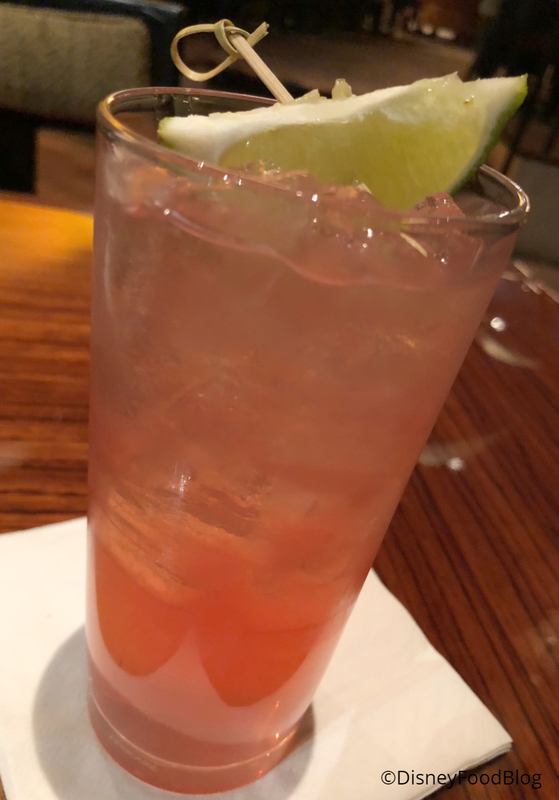 This tart and powerful drink had a fruity undertone thanks to tangy tangerine juice. It was refreshing and light — the perfect way to start a meal here, where the food is often very rich. 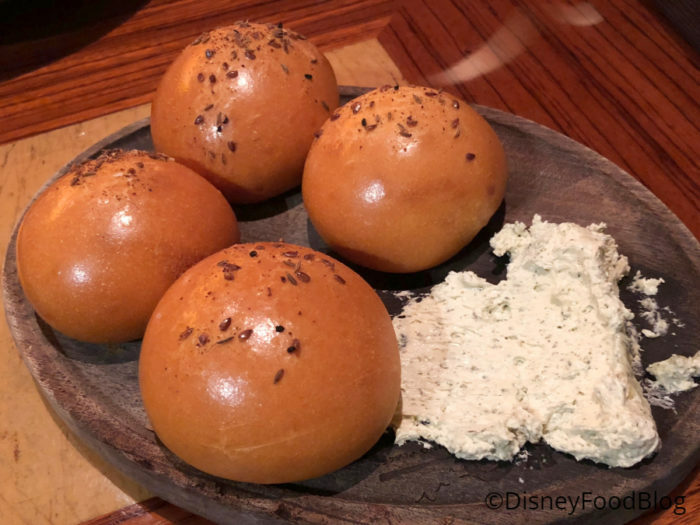 We also received complimentary rolls and butter — not always a given at Walt Disney World these days. At Jiko, spices and herbs are often used to create something that’s a step above ordinary dinner rolls. And these ones were particularly impressive for their appearance alone — check out that golden glow! The accompanying butter has a subtle sweet, cinnamon-y flavor. 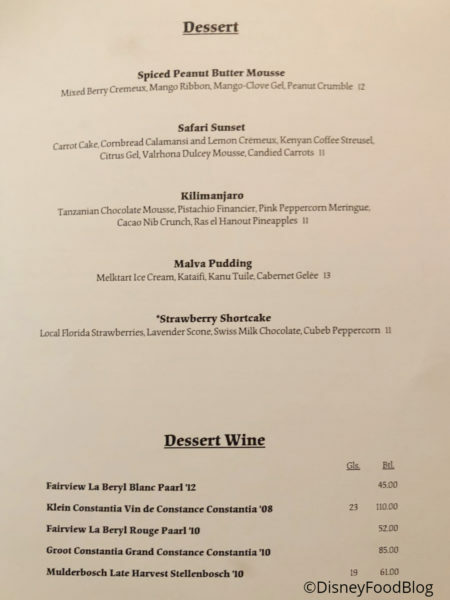 On my last reviewed visit to Jiko, I wasn’t as impressed with the menu offerings as I had been in the past, so on this visit, I was determined to try a variety of items to be sure we could keep recommending Jiko as prolifically as we have in the past. 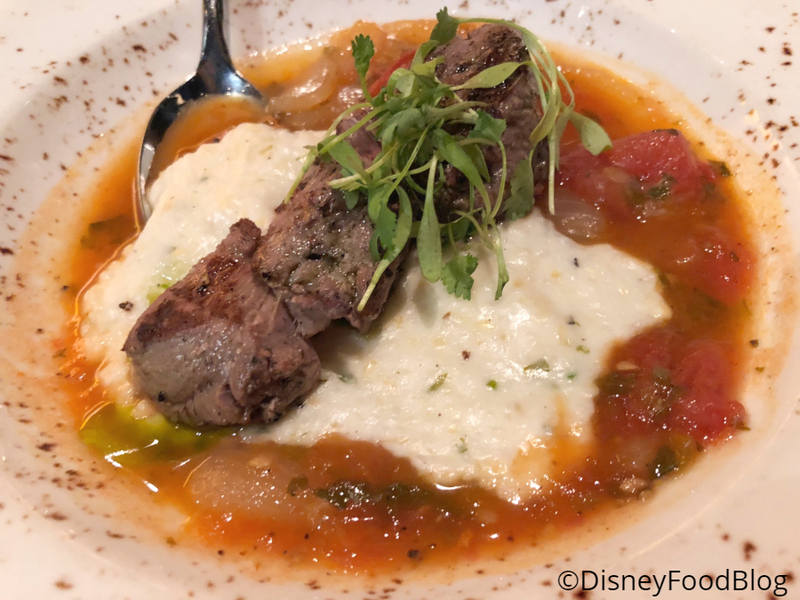 We started with the Wild Boar Tenderloin appetizer which comes with pap (a traditional corn-based starch) and chakalaka (a traditional vegetable medley often fortified with beans). The flavorful dish was tender, and I appreciated the use of traditional components done well. 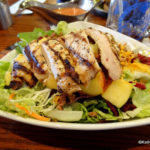 The serving was substantial enough to be a meal for diners with small appetites (or in combination with a second app). We began the entree round with Snake River Farms Wagyu Strip, and it was terrific. Perfectly rare and well-seasoned, the Strip is a lovely piece of meat. The vegetable side dish for the Wagyu was Spiced Pole Beans. These were tasty (you know I love a green bean) and a simple addition to the meat — which is really the star here. A very impressive dish, and one I wanted to immediately order again. 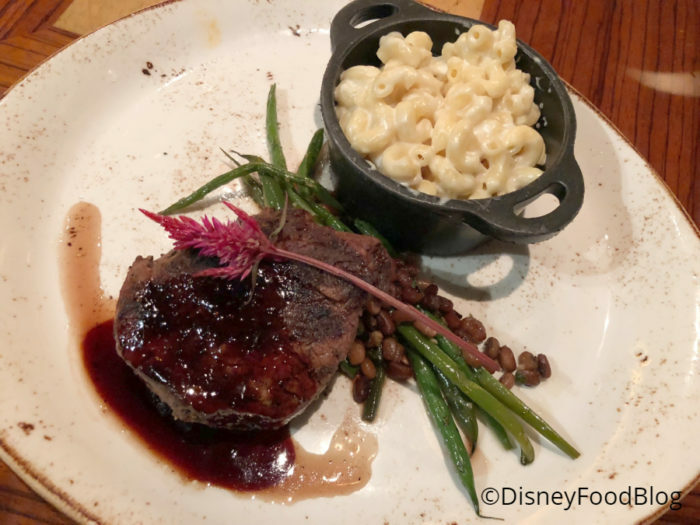 This dish (and the Oak-Grilled Filet) were noted as coming with Lemon-Salsify Puree… but when in Jiko, get the Kids’ Macaroni and Cheese! 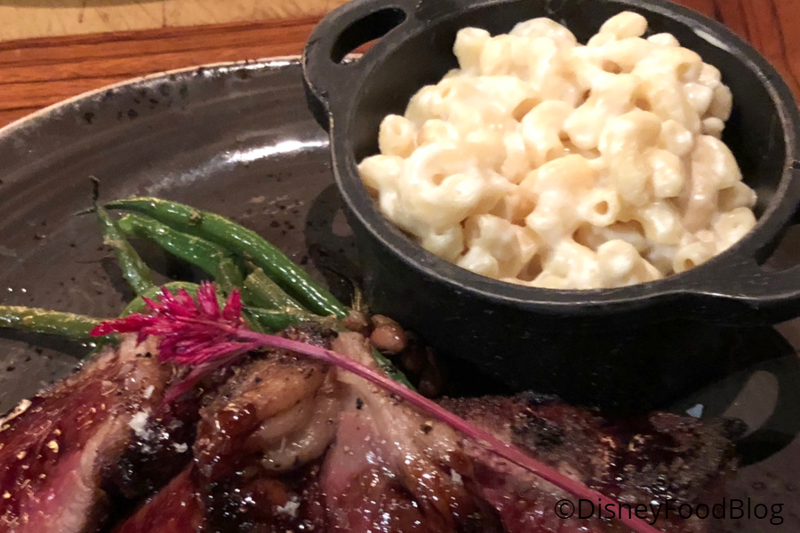 This complex version of the comforting mac and cheese staple used to be the included side for the Filet, but now the kitchen has some freshly made every day for the kids’ menu (and guests who request it — which lots of them do!). It’s also worth noting that the current (as of this post) online menu lists the mac as the side for the Strip, so double check on your visit! 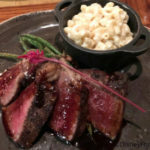 The most popular dish at Jiko is the Oak-Grilled Filet Mignon, and while the sides have undergone a few changes over the years, I still think the Mac and Cheese is the quintessential side — so I subbed it in. The same Spiced Pole Beans complete this dish. If you’re a lover of filet, this is a must. We love the Macaroni and Cheese so much at Jiko that we got the recipe! Next we tried the Mrouzia-Style Morrocan Lamp Tagine, which makes one heck of a first impression! 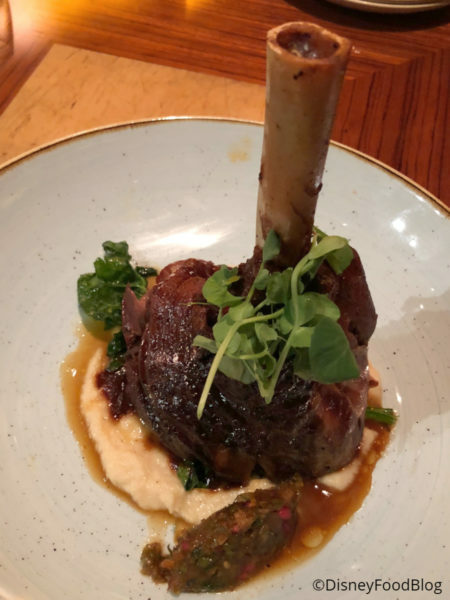 The lamb is packed with rich, complex flavors, including ras el hanout (a traditional mix of many different ground spices that may include coriander, ginger, pepper, anise, and many others). It’s that blend of spices — which can vary from kitchen to kitchen — that gives this dish its something special. The Lamb Tagine is served with Parsnip Silk, Root Spinach, Medjool Date Smoor (kind of a thick chutney), and Pomegranate Glaze. While this dish wasn’t my favorite (I’m not a lamb fan), my dining companion grew up eating lamb in her Greek family and loved this version. The sleeper hit of the night was the Botswana Seswaa-Style Beef Short Rib. Even from a glance, this dish has a homey feeling — almost like the components of a hearty stew plated thoughtfully. The accompaniments to the tender meat included Istambu Samp and Beans, Sambal, Sukuma Wiki, and Mushrooms. This dish employs several traditional African ingredients, making it something you are unlikely to have had anywhere else. It’s delicious and interesting and absolutely worth a try. Jiko is known for its rich entrees, but the desserts here are also unique and thoughtful. 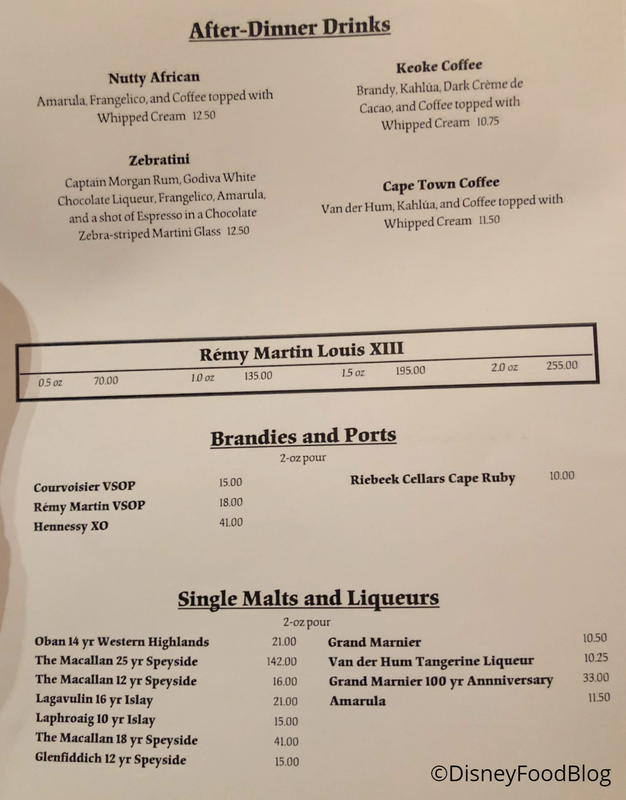 In addition to desserts, Jiko offers a range of After-Dinner Drinks. First up for us from the dessert menu was the Safari Sunset. 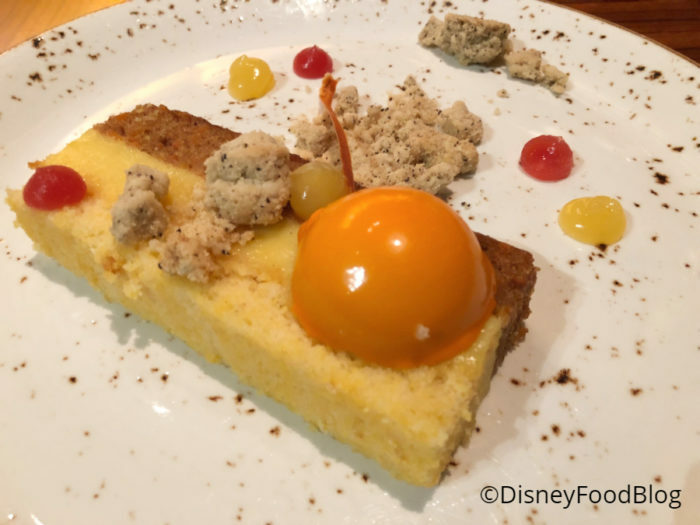 This is described as Carrot Cake, Cornbread Calamansi and Lemon Cremeux, Kenyan Coffee Streusel, Citrus Gel, Valrhona Dulcey Mousse, and Candied Carrots. And it delivers those elements in a beautiful plated dessert that — let’s be honest — doesn’t look like any carrot cake we’ve tried before. This one was fine, but strangely the best part was the streusel for me. This falls into the “fancy signature restaurant dessert” camp for me. While these desserts look fancy and have lots of components, they’re not memorable, and they’re not the kind of thing you want to order again and again in my experience. The Kilimanjaro is probably Jiko’s most well-known dessert, having been on the menu for some time. 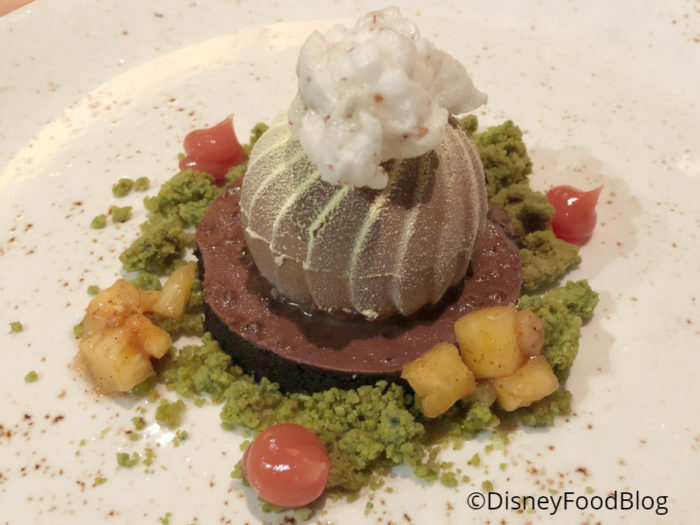 It’s comprised of Tanzanian Chocolate Mousse, Pistachio Financier (crumbled), Pink Peppercorn Meringue, Cacao Nib Crunch, and Ras el Hanout Pineapples. This is good play on textures, and there are several techniques here that really show the skill of the pastry chefs at Jiko. But the thing I remember most about it is that those pineapples tasted cinnamon-y…like a good holiday dessert. Again, it didn’t wow. The final dessert of the night was the simplest of the three we tried: Malva Pudding. 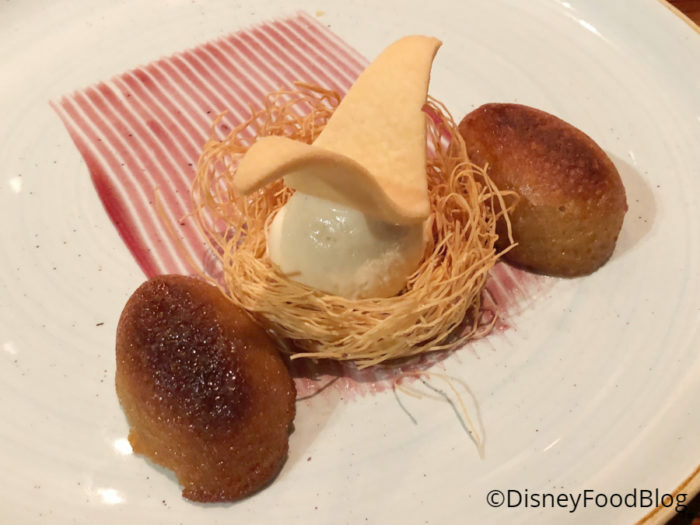 This dessert of Melktart Ice Cream, Kataifi, Kanu Tuile, and Cabernet Gelée is an artful play on this traditional, humble dessert. The ice cream is delicious — inspired by a popular African custard and ridiculously creamy as a result. The bird-like tuile is a lovely ode to the spirit of Jiko and offers some great crunch. But this was a tiny dessert for the $13 price tag, and the Malva Pudding itself was unimpressive. Overall, the desserts fell flat for me at Jiko. Jiko — The Cooking Place can be a special dining experience. 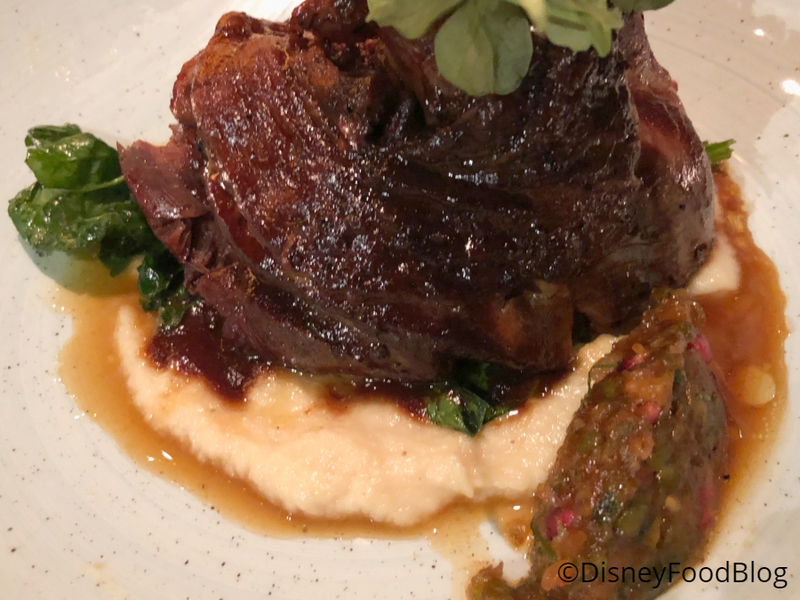 And if you’ve got an adventurous palate — or if you want to challenge some of your expectations of fine dining at Walt Disney World — Jiko is a great place to do it. But, like I said, Jiko has been hit or miss for me the past few years, so consider that when making your plans. 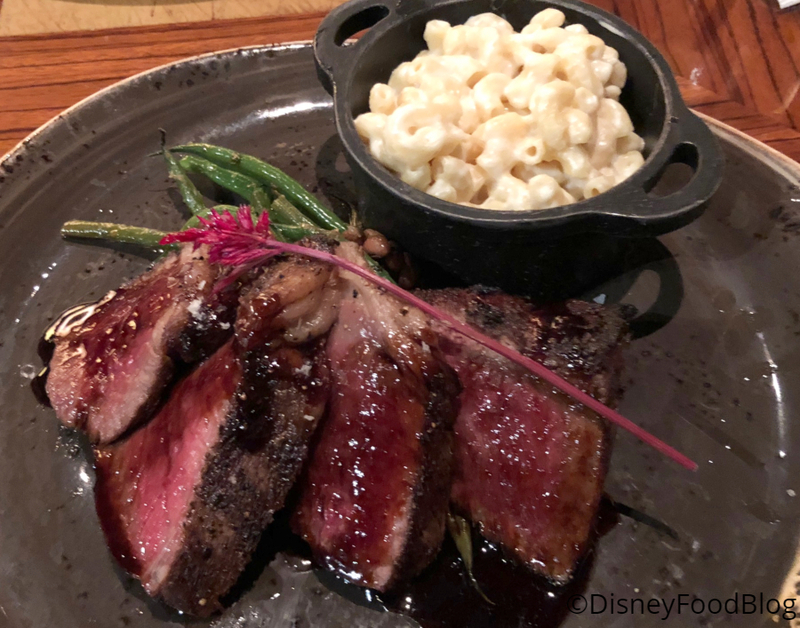 This restaurant is a long way away from just about everything else in Disney World, so it’s not a quick jaunt from a park for most people. 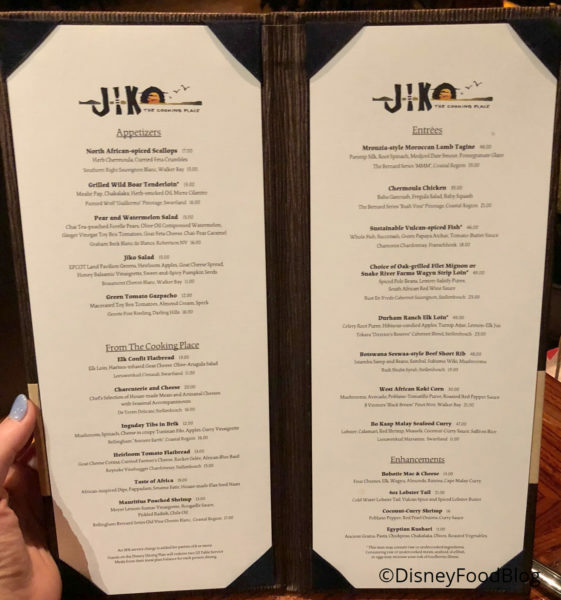 And while my visit last week offered a few of the best eats I’ve had at Jiko in my Disney career, it’s not always a guaranteed good time. You want to try food inspired by cuisines that are potentially more unfamiliar to you. 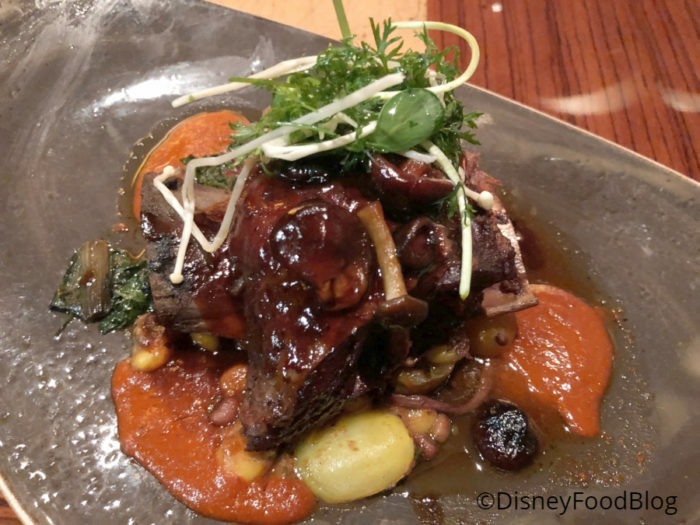 You’re looking to experience Signature dining, and you’re staying at Animal Kingdom Lodge. 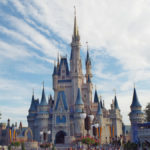 African culture and food is something in which you’re interested, and you want to experience Disney’s version of them. You don’t have an adventurous palate and don’t want to waste money or calories on something you don’t think you’ll enjoy. You want to spend your vacation dollars on souvenirs and experiences rather than expensive meals. 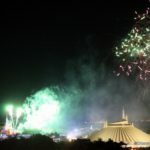 Animal Kingdom Lodge is really off the beaten path for you, and you don’t want to worry about all that travel. 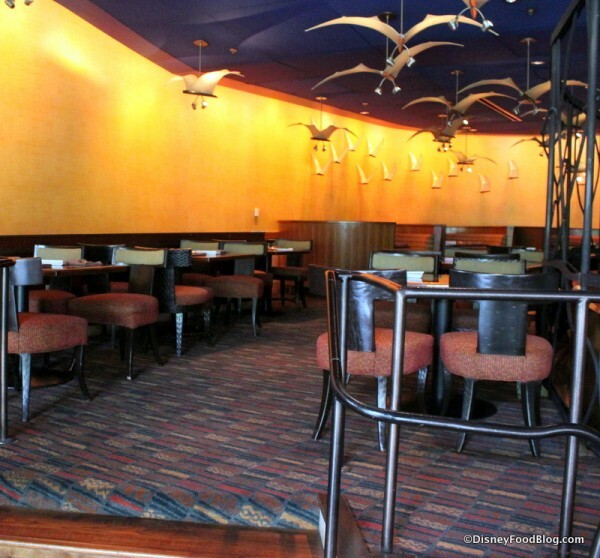 Animal Kingdom Lodge offers fabulous, FREE Culinary Tours at Boma, Jiko, and Sanaa! Read about them here! Have you enjoyed a visit to Jiko? Let us know what you thought in the comments below. My fav restaurant in all of Disney! Exotic flavors and decor. Amazing wines found only here in the US! Amazing coffee’s to go along with desserts, just can’t get enough of this place! I really enjoy Jiko. I’ve found the food to be excellent and the servers extra helpful. I had the lamb, excellent. Am a DVC owner at AKL and we have always made it a point to dine at Jiko. I do agree that most times we have had an outstanding meal , but our last trip in May 2018, I will admit it was so so, and our family was a little disappointed. I for sure would give Jiko another try and hope to not be disappointed with my next dining experience. I also agree the African wine selection is outstanding! 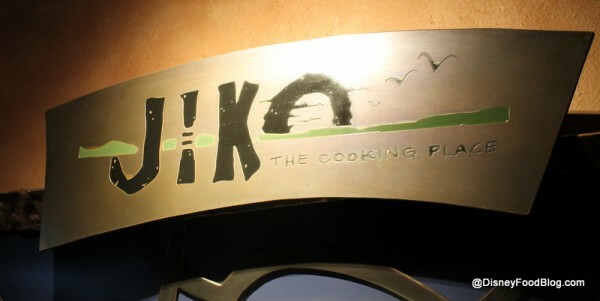 Jiko has been one of my favorite “nice restaurants” in Disney for awhile now. I appreciate that they stay true to a unique menu with robust taste and complimenting flavors. I had the lamb tagine and the play on the carrot cake dessert and I thought all the flavors hit the spot. Jiko is one of the few places left that hasn’t succumbed to “pleasing the masses”…I appreciate that Disney wants to appeal to all tastes but sometimes I find myself really searching for a menu that’s unique and not just “crowd pleasing”. By far one of my favorite places to eat. I love Jiko, been there several times. However, I was really disappointed with the desserts the last time I went. I used to always get the malva pudding, it was so rich and cream and just topped of my meal (until they changed it). 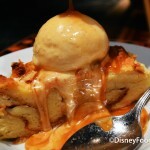 Now it may look pretty, but one of the worst desserts I have had at Disney. We loved Jiko last December (for our first ever dinner there). It was my favorite for the week and we’ll definitely be trying it again for our next visit. I will probably have the Wild Boar for an appetizer and my main meal next time as that was my absolute favorite and most flavorful dish my whole trip. Sadly, I didn’t know that before ordering but the Elk Loin was good too (just not as great as the Wild Boar).